Boulder Designs franchise owners create custom boulders from sand that are used in many applications including commercial signage and landscapes. Its sister company, Border Magic, is also a franchise company that specializes in decorative landscape edging. We publicized the purchase and relocation of the two companies by updating the existing websites’ news pages and business listings. 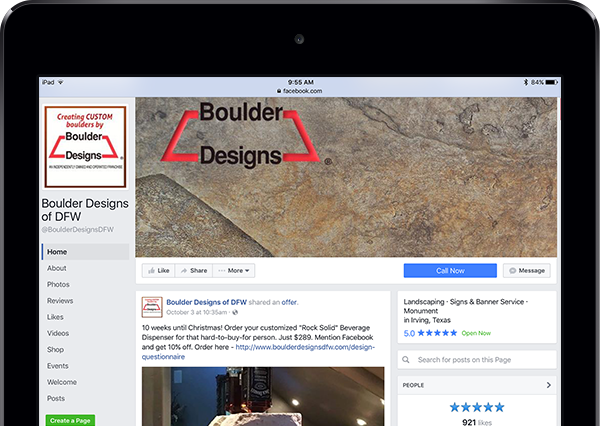 We create Facebook pages for new franchisees, and we post content on the Boulder Designs and Border Magic corporate FB pages. We work with Franchise Business Review to ensure the Franchise Satisfaction Survey is well-received by franchise owners and completed to meet deadlines. Our team identified events and opportunities to market the two companies including the donation, delivery and installation of boulders at the re-grand opening of the Heart of Texas Veterans One Stop and at the location of the 2016 Franchising Gives Back in San Antonio. As part of our marketing strategy, we wrote several articles and advertorials, including a cover story for Veterans in Franchising. On their behalf we also manage the relationship with the Wacoan magazine, including ad copywriting. We designed the newsletter and write the content every month. 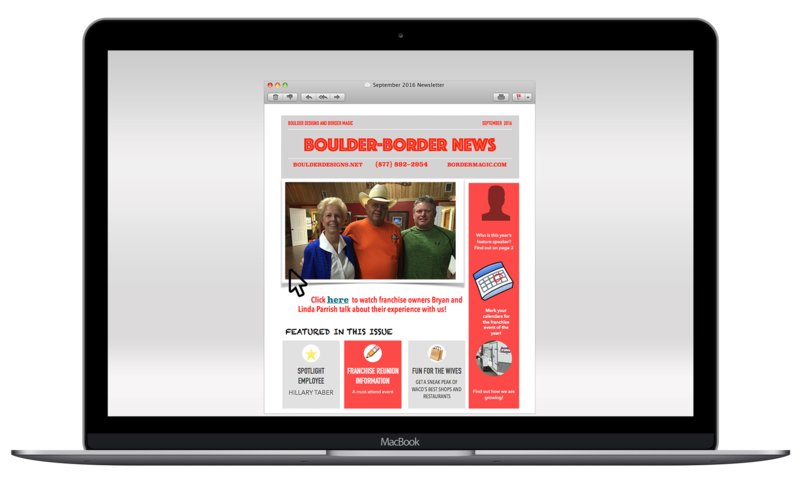 Like Assisting Hands Home Care, we are beginning to interview franchisees about why they chose to invest in Boulder Designs and Border Magic. At the November 2016 reunion, we will shoot videos a number of franchisees who attend. Need help generating leads? We’d love to help!